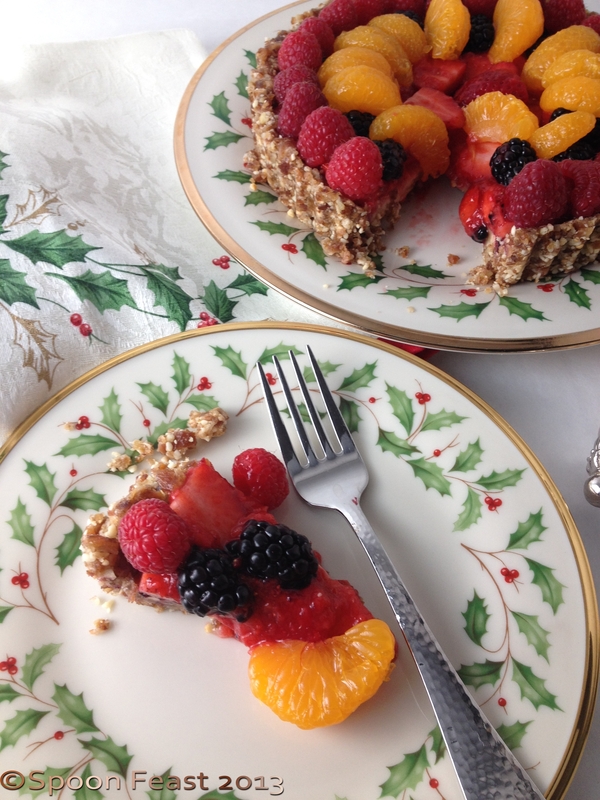 This is a series of links to recipes, videos and more for creating your perfect holiday feast. The first one is for the main item, the turkey, crown roast or whole roasted cauliflower for a vegan option. Whether this is your first Thanksgiving dinner or your 50th, here are some tips and recipes for making the feast stress free. I’m linking to the posts I’ve published over the years so click the links and create the Perfect Thanksgiving meal! How to Roast a Turkey – a Step by step guide, with pictures. Remember to click on the links for the full posts! Of course if you don’t eat bacon, don’t use it, but it sure is delicious! If not using bacon, be sure to baste the bird every 1/2 hour. If the skin gets to dark, tent it with foil. Allow ample time to roast the bird and to let the bird rest at least 20 minutes before you start carving. Save the bones to make stock. I love making stock on a cold dreary day. It makes everything smell so warm! 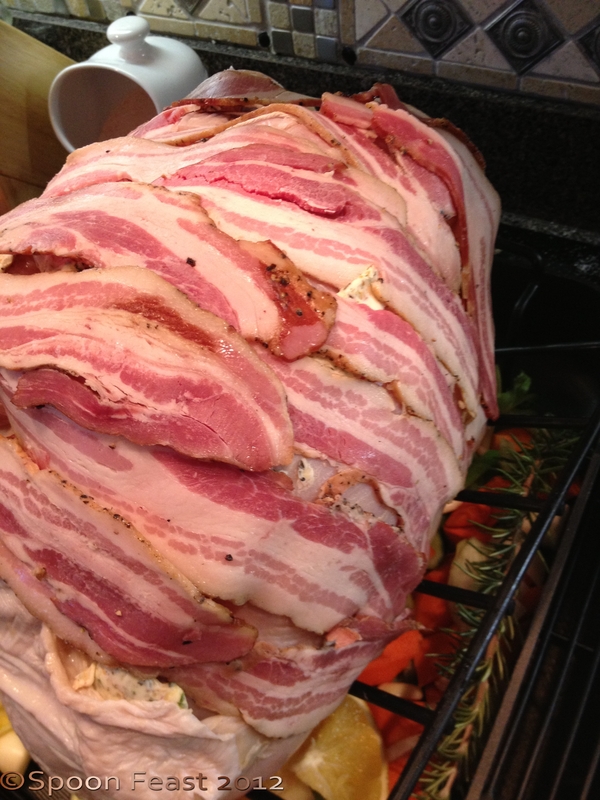 Cover with bacon strips to baste the turkey during the initial phase of roasting. Remember the large bird will roast for several hours. After the first 2-3 hours, the bacon will be done, remove it and this becomes the “cooks treat”. Continue roasting the bird, basting every 30-40 minutes. The skin will crisp and become golden brown. If the skin starts to get too brown before the bird is done, tent it with foil. Be sure to order your roast well is advance from your butcher. These aren’t typically an “off the shelf” kind of item. they will even french the bones (recommended) and tie it for you, just ask. Mid well to well 150°F and above. It is suggested to remove the number of well done portions from the others and finish those later rather than subject the entire roast to well-doneness disaster. Carry over cooking is when the internal temperature of the meat continues to rise after it is removed from the oven. Allow the roast to rest at least 20 minutes before slicing. 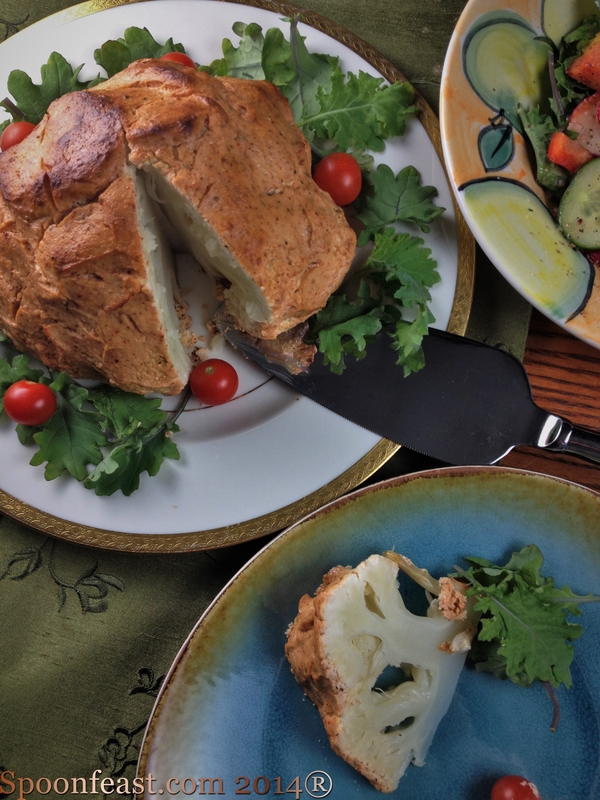 If a vegan meal is on your menu, you can Roast a Whole Cauliflower. We love this and have it often during the year. Buy large unblemished organic cauliflower; it really has the best flavor. Use Greek yogurt, it’s thicker. Or drain plain yogurt in cheesecloth or a strainer over night to thicken it. Use any leftovers to make a delicious soup! So! There are some ideas for your main menu item on the Thanksgiving table. Next up: Vegetable side dishes! Make Almond Milk – It’s So Easy! It’s so easy to make almond milk at home, why wouldn’t you? 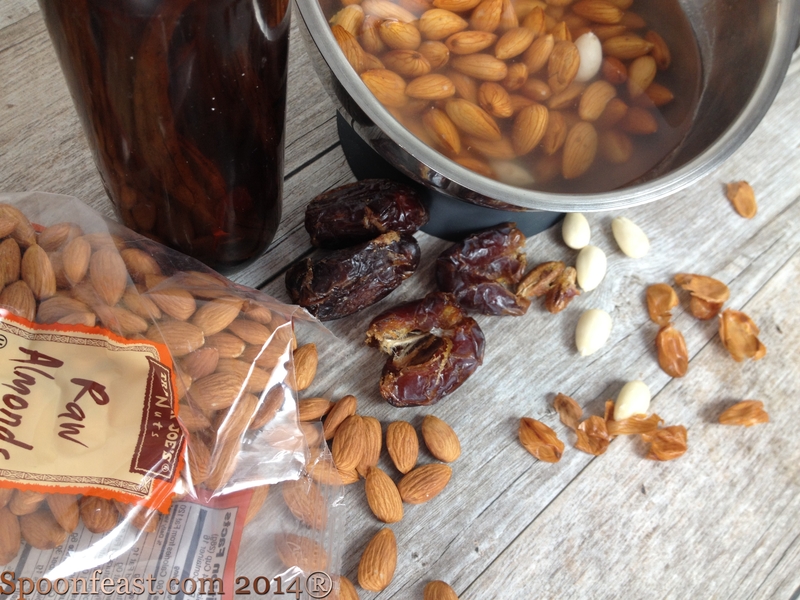 The most difficult thing is to remember to soak the almonds overnight. Once you start making your own milk on a regular basis, you’ll get into a rhythm. There is not one bit of this that is hard to do. The ingredients are few, recognizable as real food and delicious. Place the almonds in a bowl, cover them with fresh water. Cover the bowl and allow the almonds to soak for 12-24 hours. Drain the water and use it to water some plants. 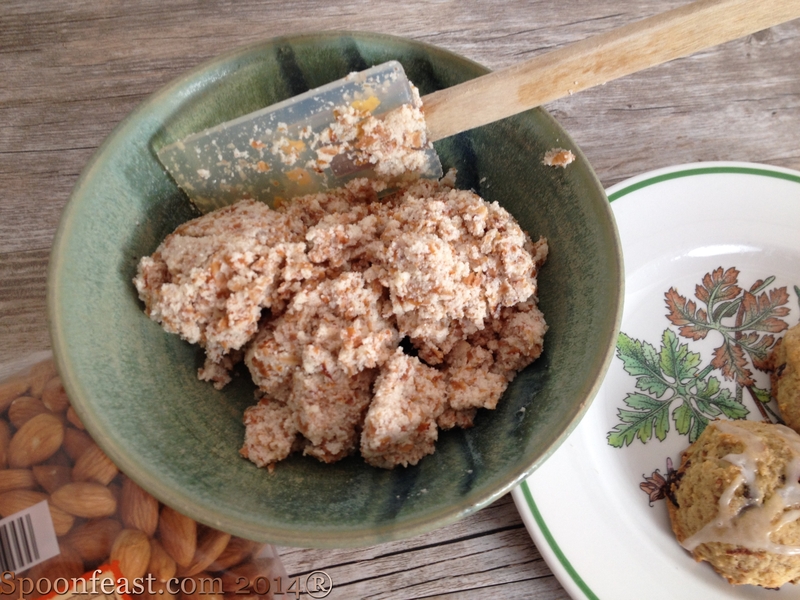 Place the soaked almonds into a blender. Add 4 cups fresh water, pitted dates, vanilla and salt into a high-powered blender. Secure the cover and turn on high. Allow it to run on high for 2-4 minutes, depending on the power of your blender. If you are using a vita-mix, use the lower time to 2 minutes, more generic style blenders, process for a longer time. 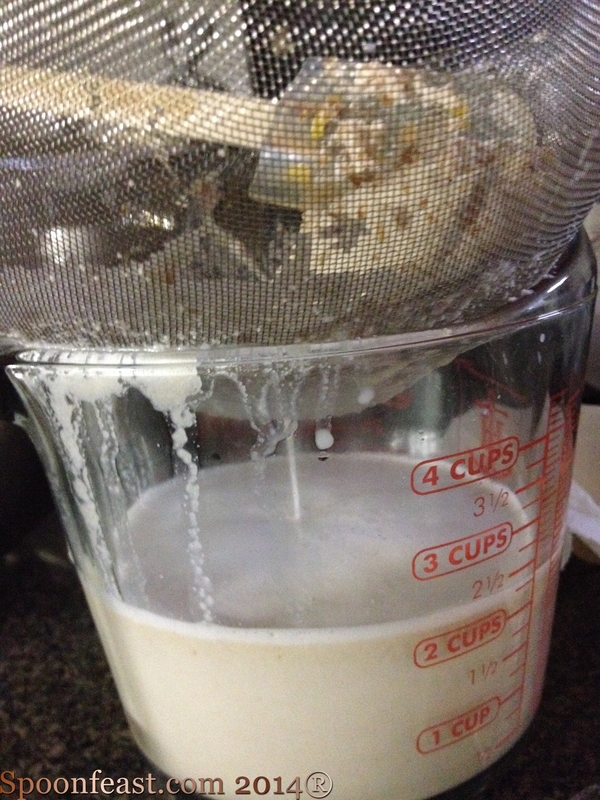 Use a wire mesh strainer over a bowl to strain the milk from the solids. Using a rubber spatula or bowl scraper,work the almond, date pulp around the wire strainer until it’s as dry as you can get it. Save this for another use, after all it’s just ground almonds, dates and vanilla. Pour the milk into a pitcher or milk jug and refrigerate until well chilled. This milk is very lightly sweetened and is the consistency of whole milk. If you want it thinner, add more water, thicker, use less water. Same with the dates for sweetening. oa powder with the dates. Simply amazing. Once you try this homemade almond milk, you’ll be so spoiled! 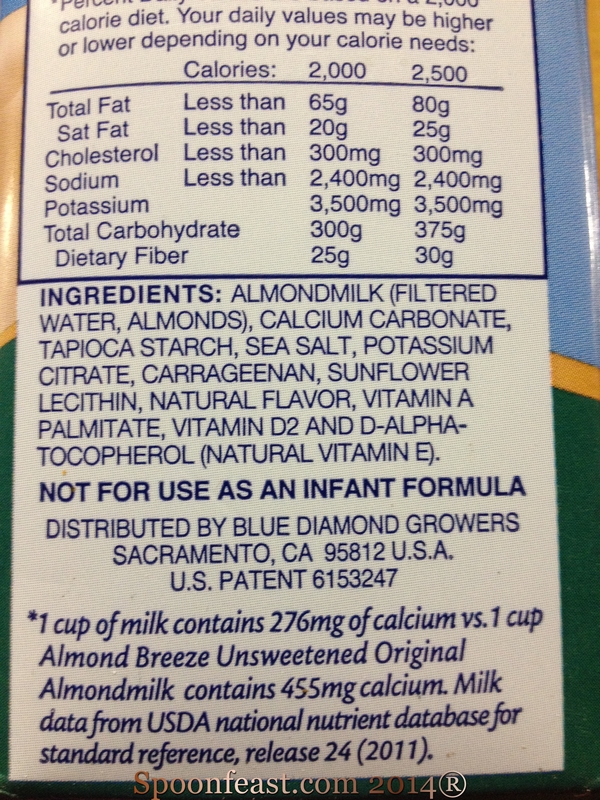 Read the labels on a store-bought almond milk. Which would you prefer to drink and give to your family? 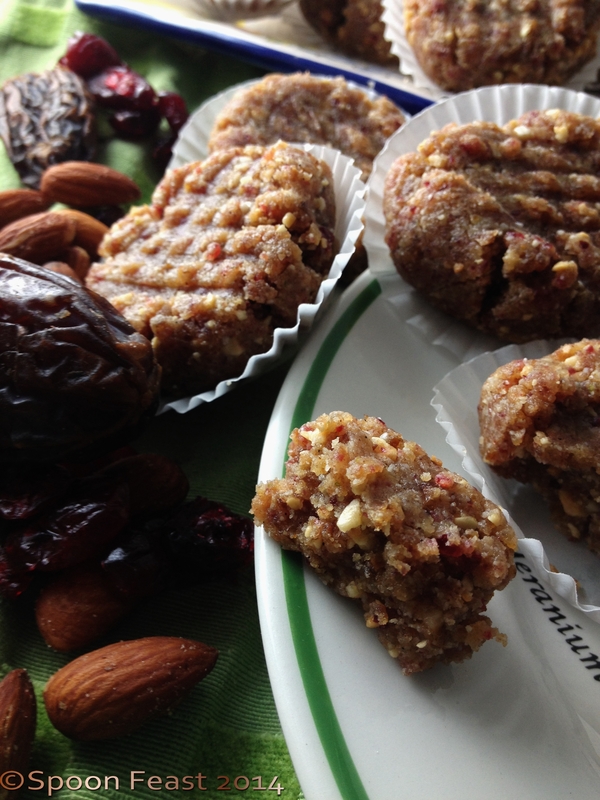 The ground almonds and dates left over from the process make nice cakes and cookies. I’ve used the almond debris to replace zucchini in zucchini brownies with great success. I’ve made Chocolate Almond Cherry Ice Cream and no bake almond butter, date and oat balls. 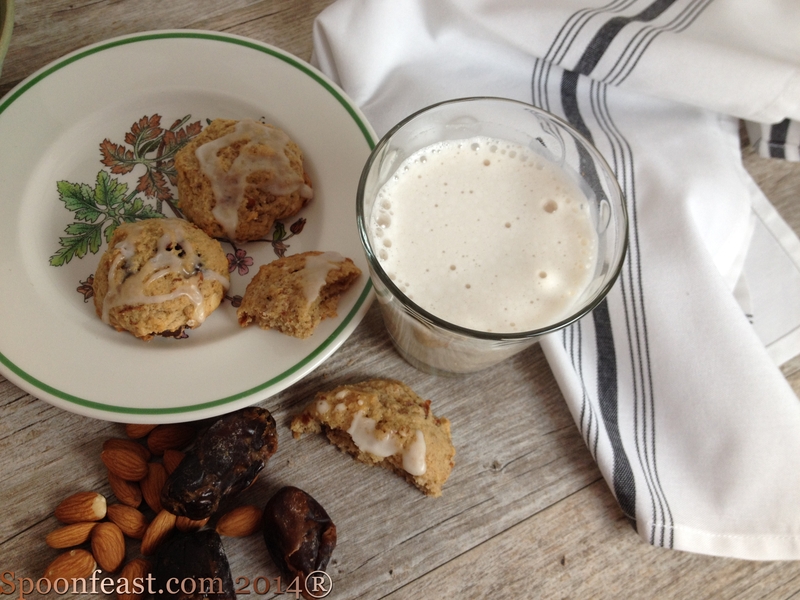 How do you use the almond debris left over from the milk? I’m getting fat from the cakes and cookies! 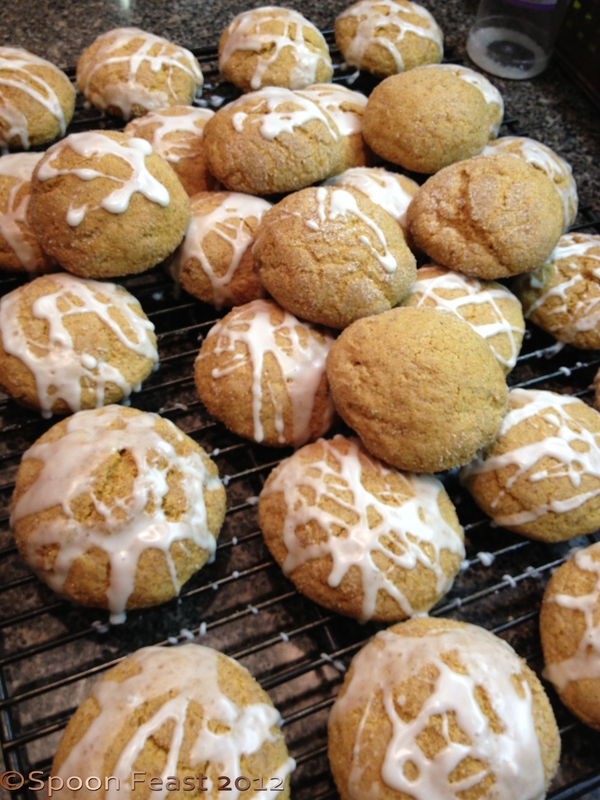 Pumpkin Snicker-doodles are delightful. 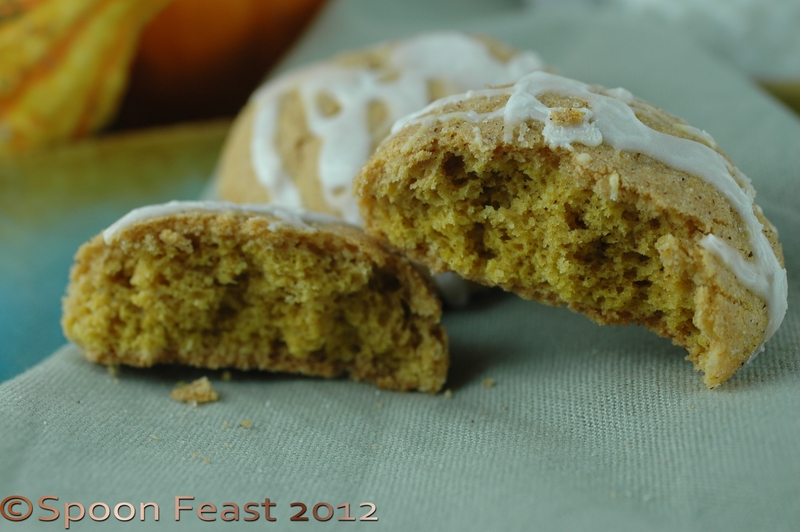 Full of rich Autumnal flavors, they are sure to please your sweet tooth craving. I made last year and sent some down to Tyler. I had my culinary students make them to share with the local Ronald McDonald House, and now my son wants the recipe again. He had several friends last year who were going to another friends home for Thanksgiving and they wanted to take these pumpkin cookies. So somehow they found a kitchen to bake in. We had an afternoon of “cooking by text” with successful results. Hopefully they had enough to take to their hostess. This year he and his girlfriend are in apartments and have their own kitchens. They are going to cook for each other this year. 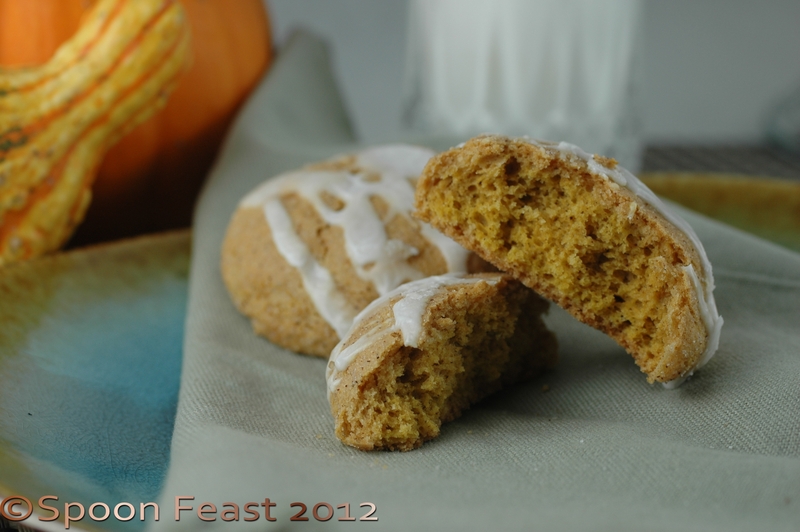 I am publishing the recipe for Pumpkin Snicker-doodles, along with the method and photos so one of them can make the cookies again. 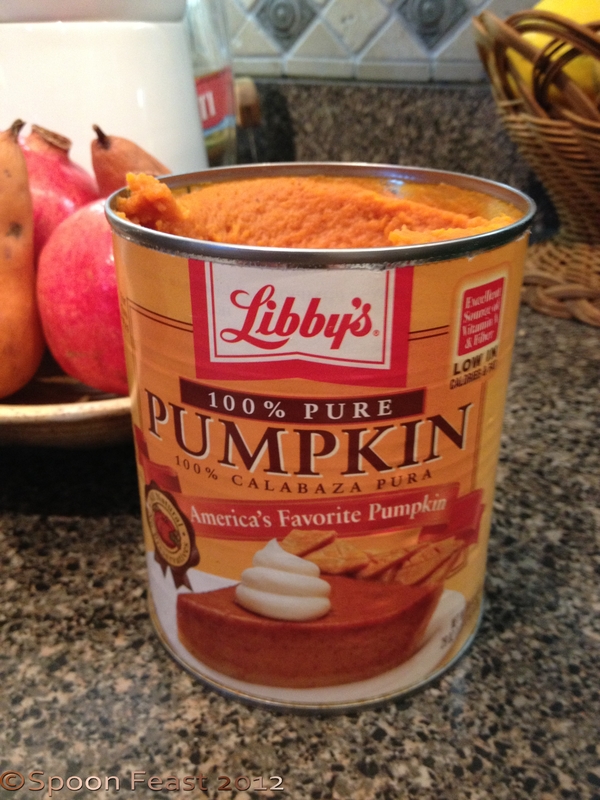 So, you don’t like pumpkin? Substitute mashed banana instead of pumpkin. This recipe makes a lot of cookies so you may want to cut the recipe in half or just share! 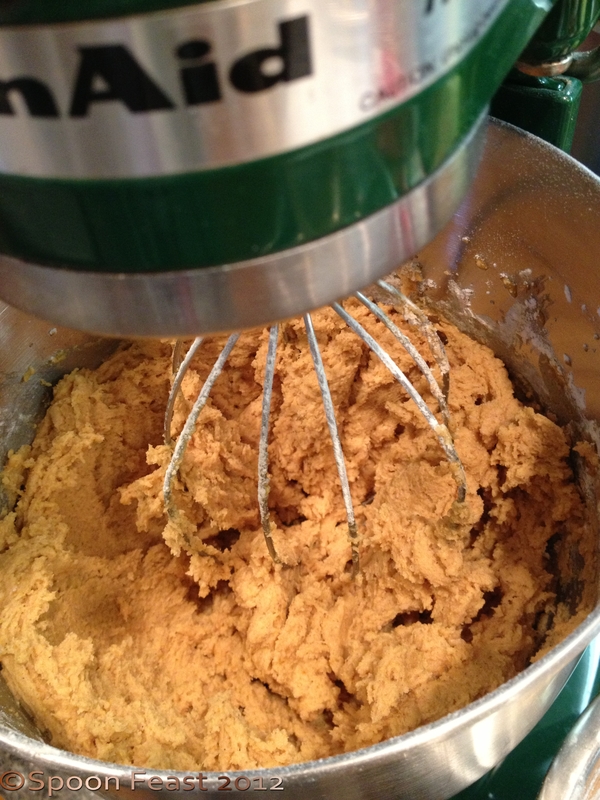 In a large mixing bowl beat butter, both sugars, eggs, pumpkin puree, and vanilla on medium until butter is evenly incorporated into pumpkin. In another bowl combine flour, baking soda, cream of tartar, salt and spices. Space the cookies 2″ apart on a lined sheet pan. Use parchment paper if you don’t have a silpat sheet. 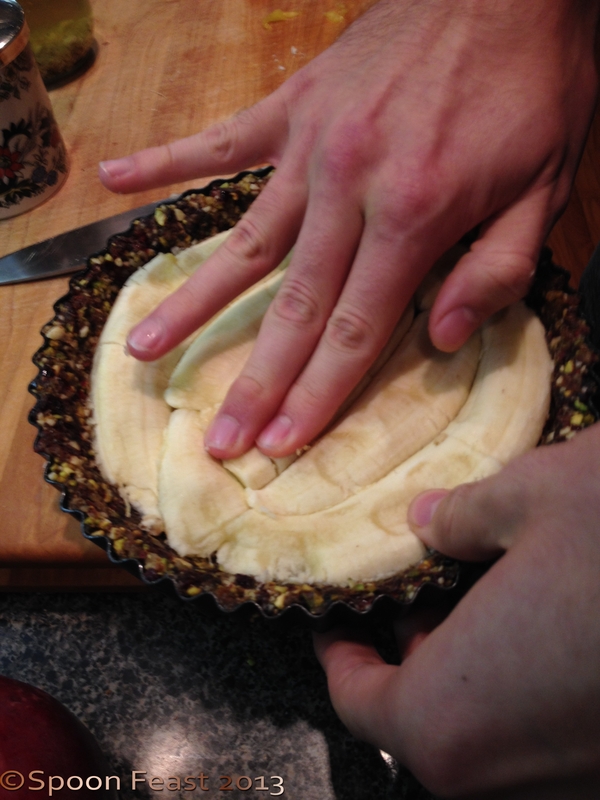 Flatten slightly with your fingers. Beat dry ingredients into wet until it is all mixed in. The dough will be fluffy but very sticky. Using a cookie scoop or two spoons form golf-ball sized balls with the chilled dough. 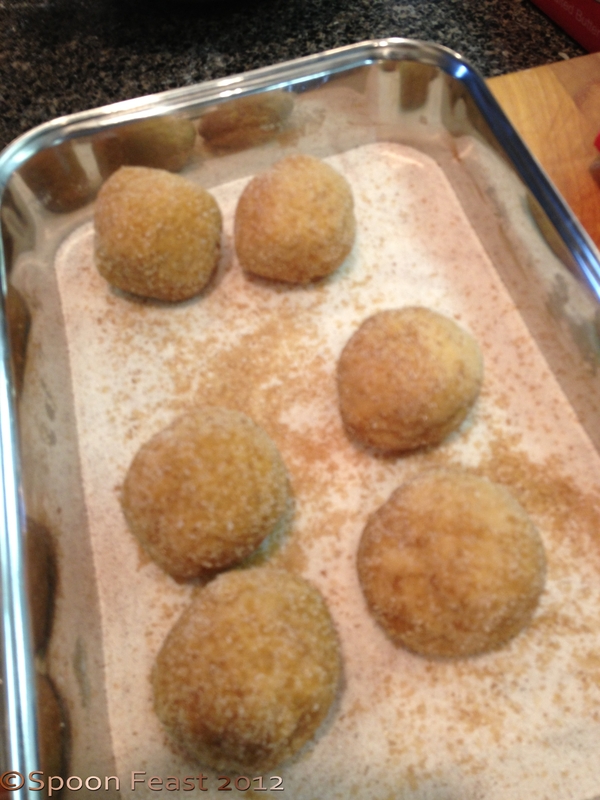 Roll balls in cinnamon sugar. Place 2” apart on a baking sheet lined with parchment paper. Flatten slightly with fingers, but not too much. 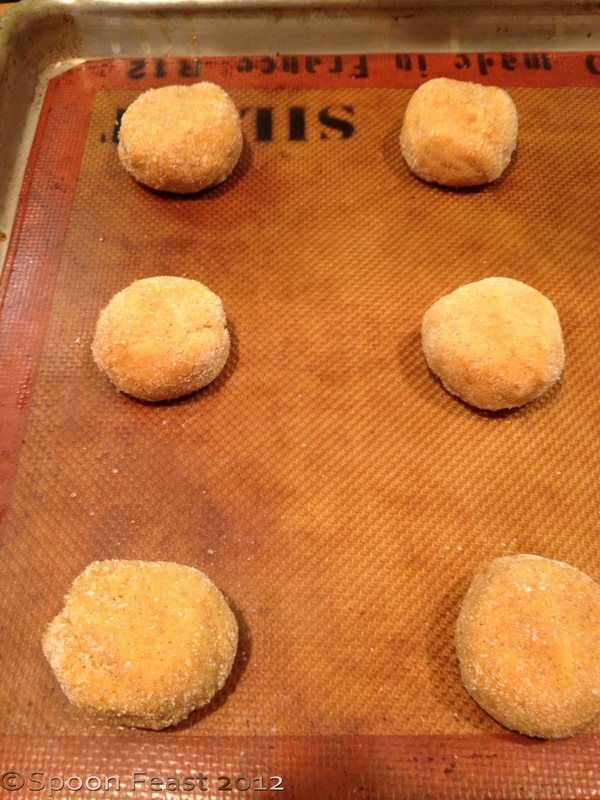 Bake for 15 minutes, or until the tops are crackled and the edges are light golden brown. Let cool for a couple of minutes on the baking sheet before removing to cooling sheets. Cool cookies on a wire rack before drizzling with icing sugar. To make icing sugar, combine 10x powdered sugar with a small bit of milk and a few drops of vanilla. Add the liquid a few drops at a time as the sugar will reach drizzling consistency quickly. Us a fork to drizzle, allow to dry before stacking cookies. 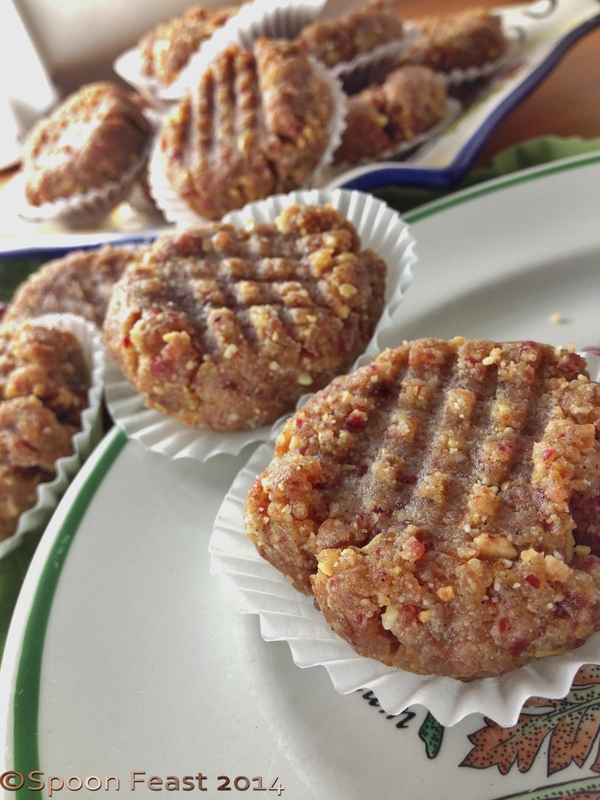 Almond, Date, Cranberry and Lime “No-Bake” Cookies are a real treat! 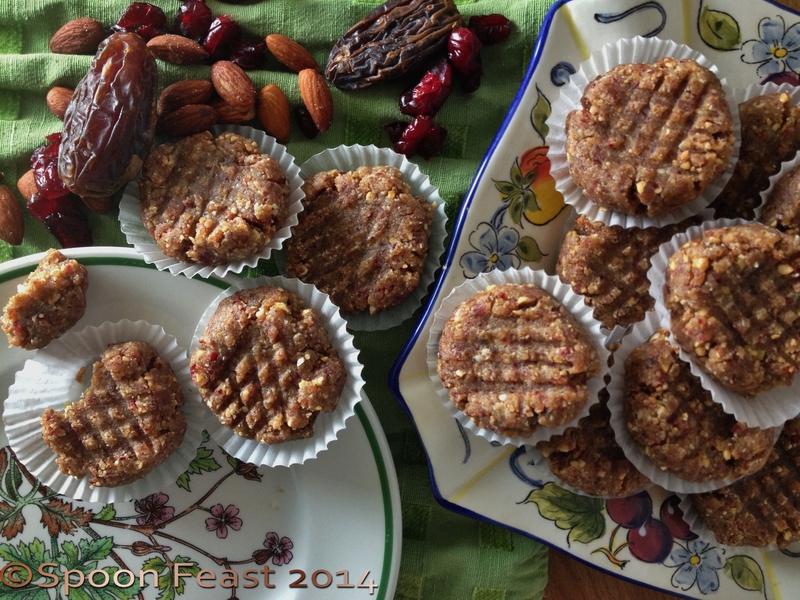 They are a “no-bake” cookie which puts them in the raw category; they are no sugar, eggs or butter so they also fall into the vegan category. With all natural ingredients so they also fall into the healthy foods and nutritious category. Personally, my favorite category for these morsels: Delicious! Keep in mind some people might be put off thinking they are eating a raw cookie. So change the language and present these delicious morsels. NOTE: Don’t fall prey to marketing ploys and think that because the label claims “healthy, all-natural or nutritious” does not mean low in calories! Learn to read a nutrition label and compare information. Here’s the recipe for the cookies. It’s pretty much put it all in a food processor and pulse until a dough forms. Have fun! Place all ingredients into the bowl of a food processor. Pulse until a dough forms. 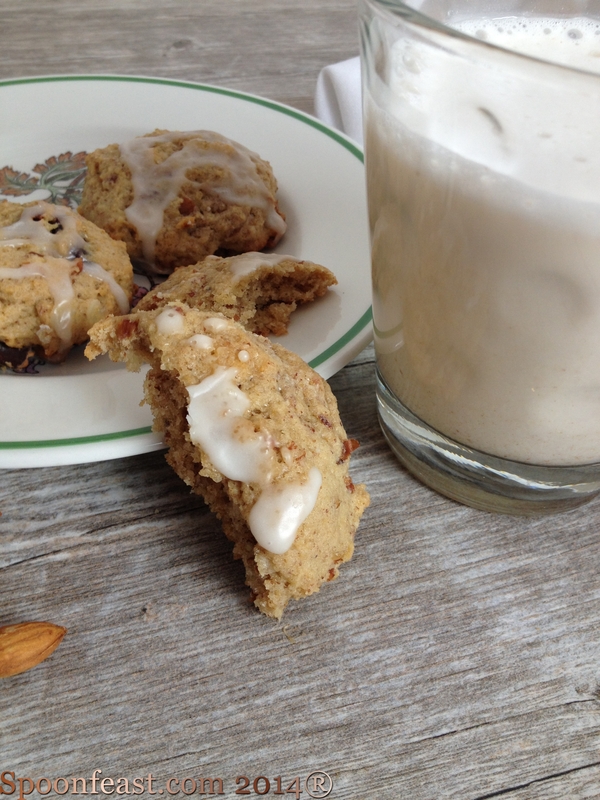 Leave some nuts chunky for a cookie that has some crunch. Taste the dough and see if it need adjustment: a bit more salt? More vanilla or lime? Form the dough into about 18 balls. Place the balls on a cookie sheet. Flatten each cookie with a fork. The texture is kinda like fudge but in a much better way. If you leave some nuts slightly chunky, your cookie can have a crunchy texture too, but if you want a smooth cookie, pulse until smooth. You can choose to roll the cookies in coconut, chopped nuts or cocoa with a dash if cinnamon if desired. Use peanut butter, cashew or almond butter with cocoa in it. I guess in a pinch you could use Nutella but the point here is to avoid added sugar and processed foods in delicious ways. Most people would never realize these are considered “raw food” but they are. These certainly aren’t low in calories but the sure supply great nutrients: Potassium, fiber, iron, B-6 and magnesium and vitamin E.
Just a note, you can leave the coconut oil out but it adds so much, I would use it. Oh, and don’t bake these beauties for any reason! If you try, all that will happen is the oils from the nuts will leak out and leave you with a rather unpleasant mess. So if you want a baked cookie recipe, use another recipe, not this one. Hopefully you make your own vanilla extract, if not, go get ya some vanilla beans and some 100 proof vodka and make some! Please make a batch of these and let me know how you like them and how they go over with friend and family. 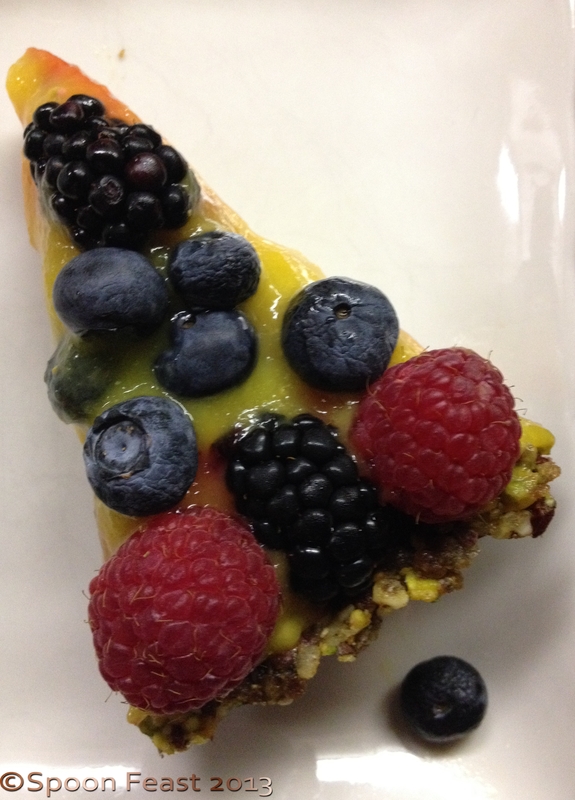 Nut Crusted Fruit Tart Re-Visited was in the make as we ate the first tart. So delicious, we started talking how we could modify the recipe. This is how we changed it. 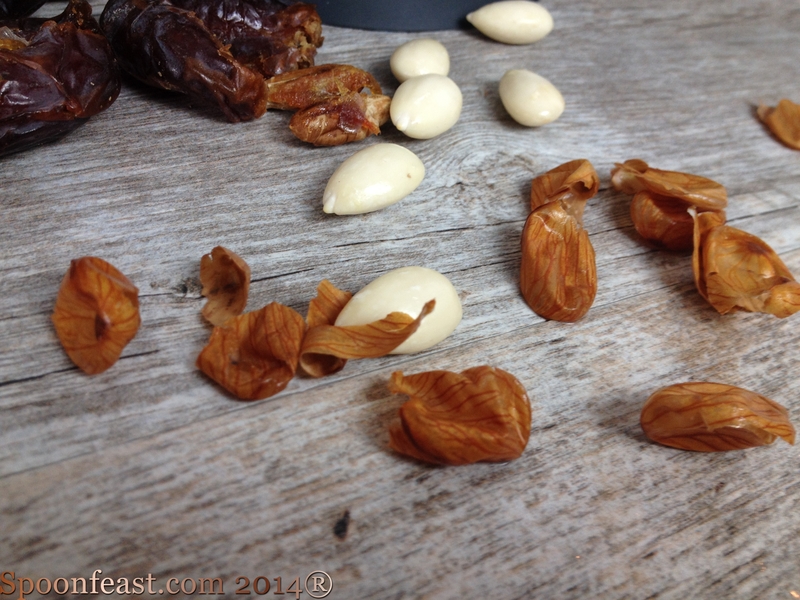 Keeping in mind the ratio is 1 cup dried fruit to 1 cup nuts, the possibilities are limitless! Look at that crust! 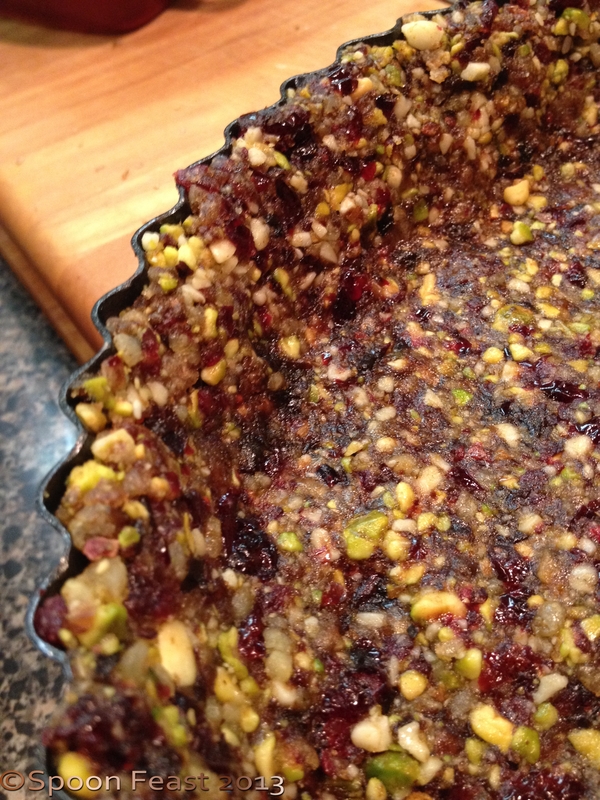 I love how the cranberries and pistachios look! This made a beautiful crust! Just process it all in a food processor and press it into your pan. The consistency should hold together when your squeeze a bit of the mixture in your hand. If it doesn’t, add more dried fruit until it holds together. This time I photographed how to lay in the bananas. Tyler asked if the bananas could be substituted but the role they play is to provide a nice base for the fruit to lay on also, to absorb some of the juices. 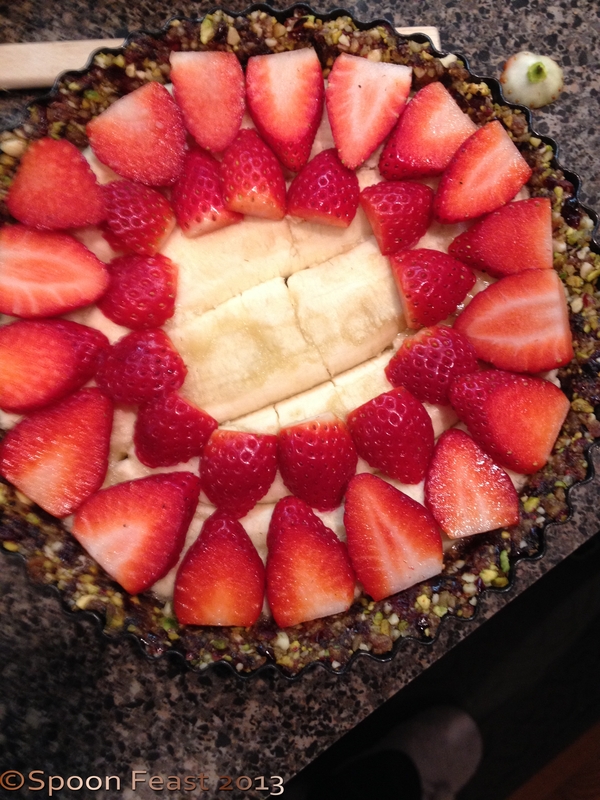 The bananas also mimic the custard, pastry cream or marzipan filling on traditional fruit tarts. Here’s how you lay the bananas in the pan. Flatten the bananas into the pan, cut side down. 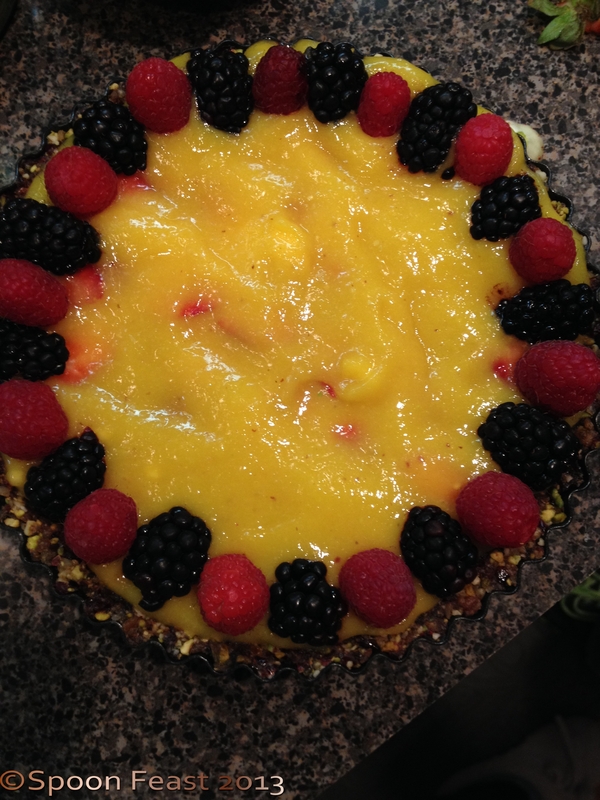 We were short on strawberries for the puree, so we pureed a mango instead. I think kiwi puree would look amazing! 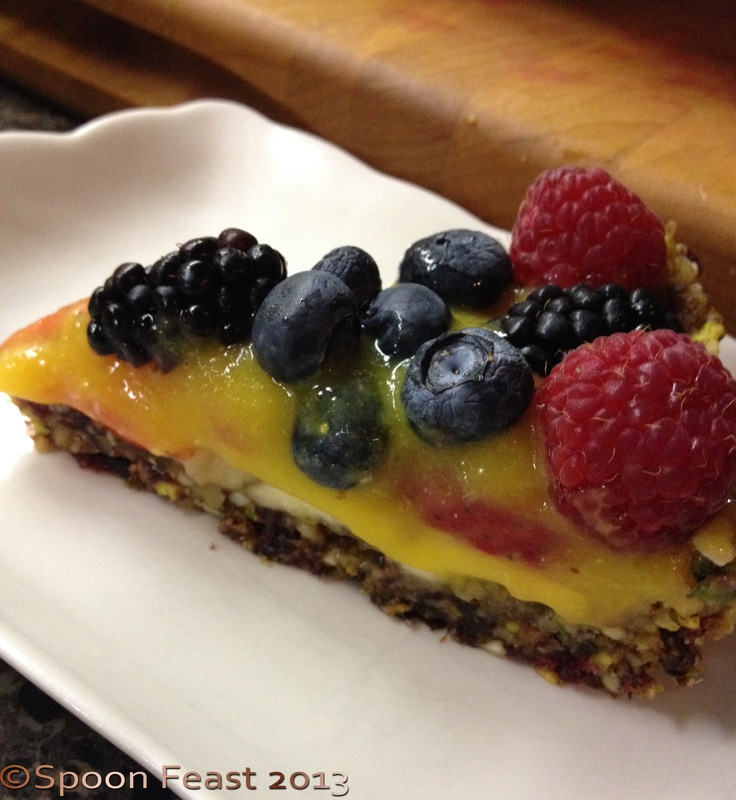 On top of the bananas, we placed sliced strawberries, then poured the mango puree over the top of the tart. 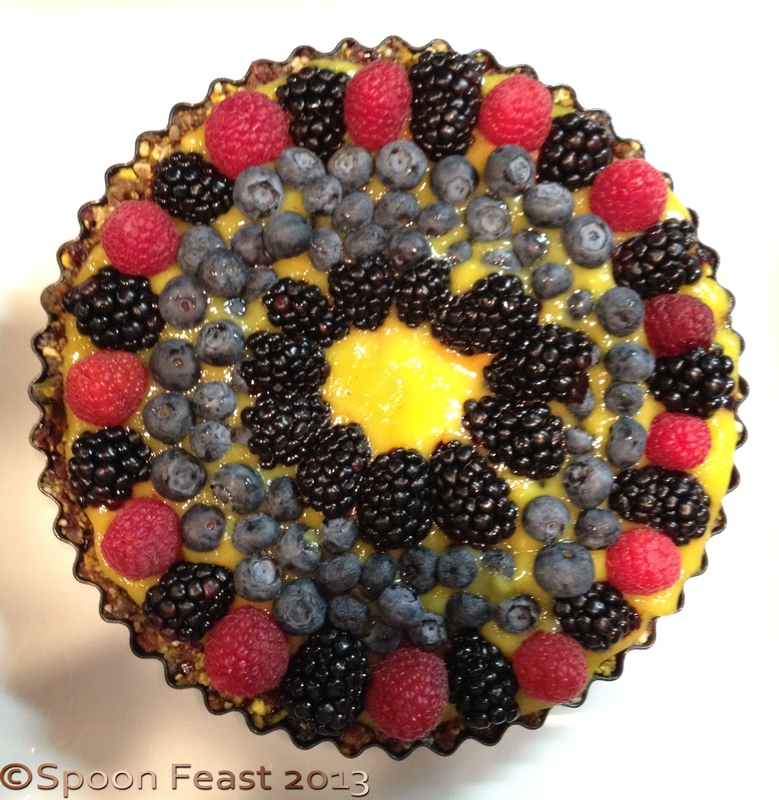 Then we placed raspberries and blackberries around the edge, a ring of blueberries, then a ring of blackberries, leaving the center open to show the brilliant mango color in the center. To maintain a healthy dish, instead of adding that tempting dollop of whipped cream, use Greek yogurt flavored with honey and vanilla instead. And if mint was growing outside now, I’d also add a mint leaf or two. No cooking! 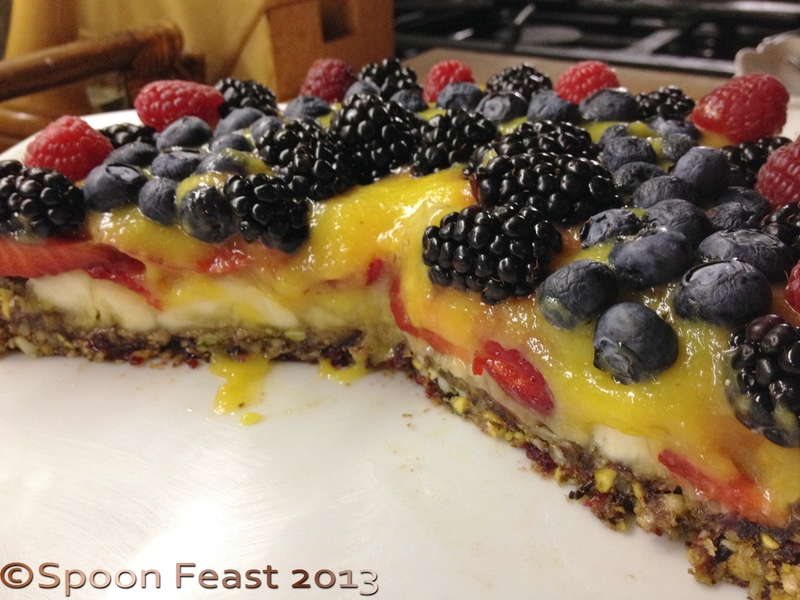 All you need to make this is a knife, cutting board, a food processor large or small, a tart or pie pan. Since Tyler is moving back on campus next semester, he will use his Kitchenaid “Handy-Chopper” which is a nice small convenient unit. Tyler has decided to use this as his signature go-to dish. I think his roommates will be impressed. Learning how to make mustard can be as simple as mixing a few things together or as complicated as soaking a few seeds. It’s not hard at all to make. 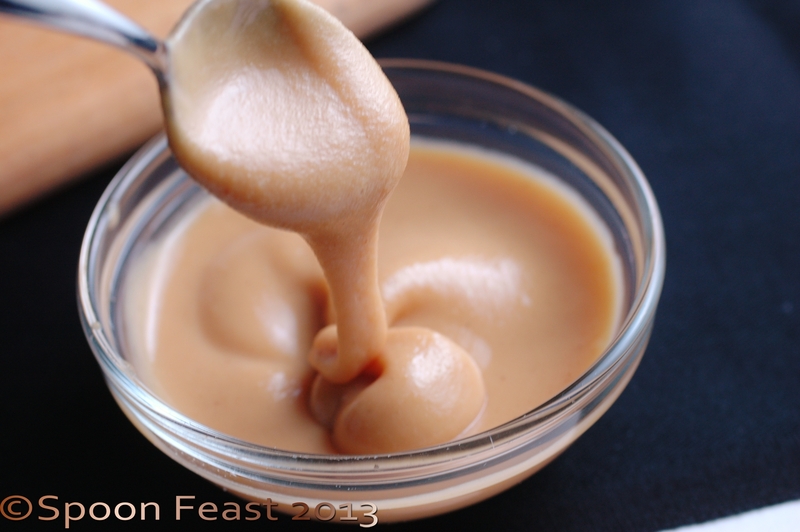 While there are many different kinds of mustard you can make, this is a kinder gentler mustard, not too pungent. All it takes is mix the ingredients together, heat until thick, bottle and cool. 1/2 cup dry mustard powder, Coleman’s is my favorite. Measure and mix everything in a heat-resistant bowl until a thin smooth paste forms. Place the bowl over a pot of boiling water to make a double boiler, heat the mixture until it becomes thick. As the mustard thickens, whisk so it remains smooth. 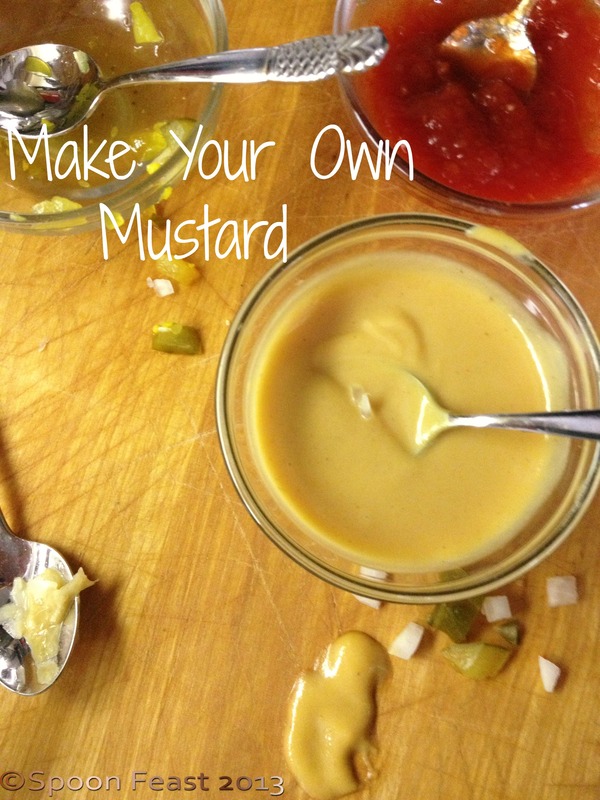 Use a silicone spatula to get all the mustard in to a clean glass jar. Allow to cool, cover, label and store.The mustard needs to sit for at least 2 hours before serving. The mustard will also “mellow” as it ages in the refrigerator. I haven’t had a jar around long enough to tell you how long it lasts. Use it as you would any mustard but be warned, it will spoil you from buying processed store-bought mustard. 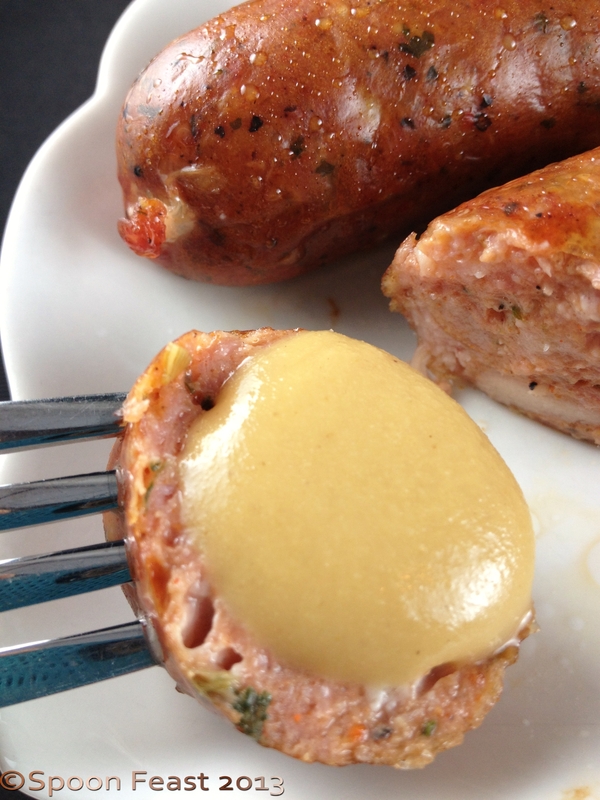 Dip a tasty sausage into mustard! 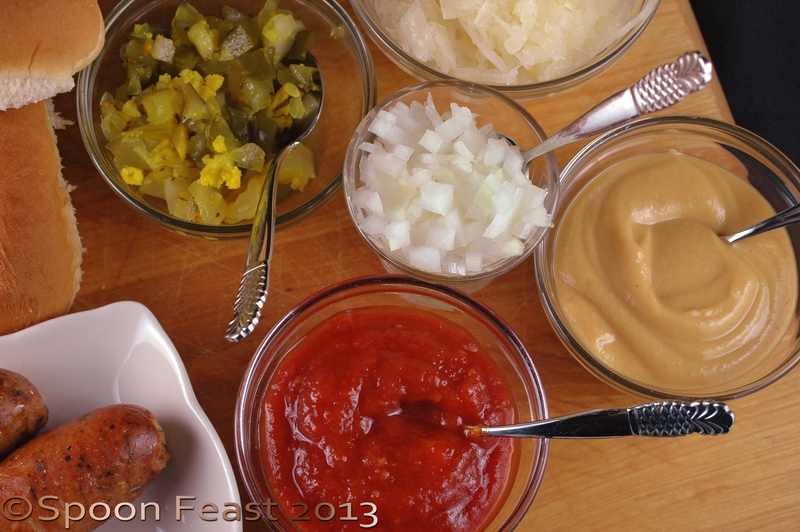 More mustard recipes coming soon such as whole grain mustard, Dijon style, champagne honey, and pear/apple mostarda. Learning how to make mustard is an easy thing to do to reduce your consumption of processed foods. 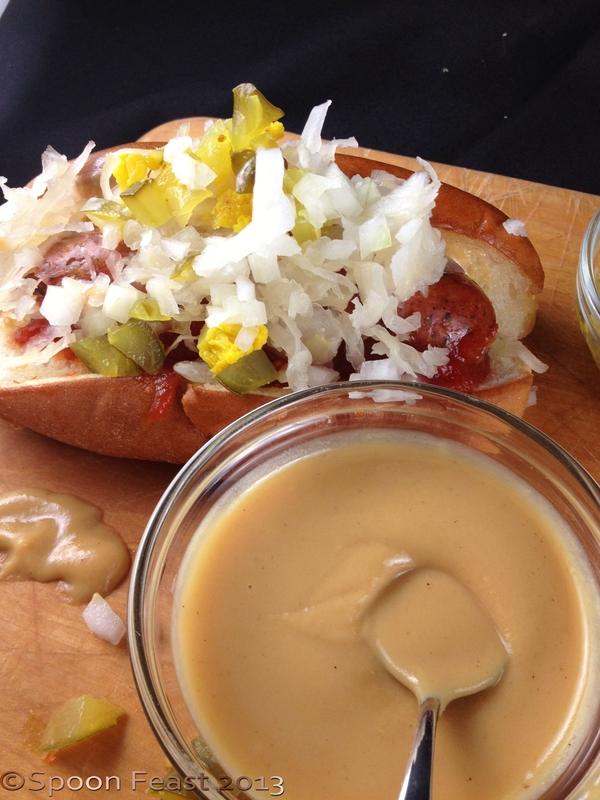 Basic Mustard – Got a Pretzel? The best video I have ever seen on how to do this process. Buy some chickens, do it and practice! Cooking time is about 2 hours at 350°F is a roasting pan. Place a small bit of stock in the bottom of a pan with a couple of chopped carrots, onion and celery for flavor. Use your favorite stuffing. When practicing, I make and donate the cooked chickens to Ronald McDonald House so we don’t get sick and tired of eating skills practice. As Jacques says, you can do this with all birds.